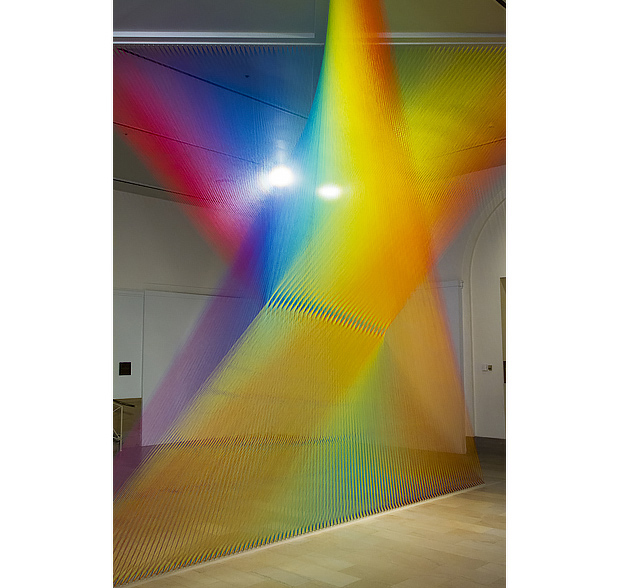 The Newark Museum presents The Shape of Light: Gabriel Dawe, featuring large-scale, site-specific installations, sculptural works and works on paper by internationally known multi-media artist Gabriel Dawe. Born and raised in Mexico City and now based in Dallas, Dawe creates site-specific environments from colored thread that explore connections between textiles, architecture and the human body. For The Shape of Light, he will create two temporary large-scale installations, Plexus no. 30 and Plexus no. 31, which will engage with the Newark Museum’s historical architectural spaces, taking over the main galleries for the run of the exhibition. The most extensive museum presentation of Dawe’s work to date, The Shape of Light allows visitors to experience two installations in sequence and in context with works that highlight Dawe’s unique engagement with materials and processes. In a related series of sculptural works, Dawe explores the power of clothing to express identity and personal history. Altering textile fragments and everyday garments—sometimes beyond recognition—with straight pins and other materials from the world of fashion, Dawe creates unexpected and highly textured objects with a surreal and slightly animate quality. A selection of abstract line drawings will also be on view. Dawe’s installations for Newark are part of an ongoing series titled Plexus, referring to the network of nerves within the human body. Each of Dawe’s installations is a unique form that transforms and illuminates its architectural setting and invites extended looking. Designed to be encountered from multiple vantage points, Dawe’s finely layered planes of color and angular forms appear to shift and change under the viewer’s gaze. Reconceiving the structure and materials of weaving on a grand, inventive scale, Dawe’s Plexus works question constructed notions of masculinity and femininity, art and craft, strength and fragility. Dawe’s work has been exhibited throughout North and South America and Europe. Mary and Cliff Blanchard/Wm. Blanchard Co.
Additional support provided by The Marie and Joe Melone Exhibition Fund for American Art and the Elizabeth Richards Family Exhibition Endowment Fund.